Were there any trends in your chapter for what type of badge was purchased, if any? Were the trends by chapter or by pledge class, or was there a good variety? Or did most not buy them? I know some don't have as many options, but several orgs have what seems like a zillion different options, from plain to jeweled to enameled to white gold. And pictures please! ETA: Here's a PDF of the NPC badges. Is there an image like this for the IFC badges? 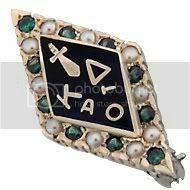 Many women from my pledge class (in Jan 2002) chose sapphire and pearl badges, myself included. Several also got chapter letter guards. It was mostly coincidental.Before my class there were more plain gold badges, and some while I was there also bought pearl badges. I don't think I saw any diamond badges. For Kappa you can get any combination of one or 2: sapphire, pearl, or diamond, as well as plain. Guards are optional as is enamel on the letters. We don't offer different types of gemstones with our badges (only pearls), but we do offer silver now and I see people going with that now intead of the gold option. Back when I joined, I'm pretty sure it was only available in gold. Last edited by KSUViolet06; 10-29-2009 at 10:33 PM. I know some girls in my chapter don't have badges. I think some other orgs include the price of badges in their dues. Most of my class got badges because we were the charter class! We actually got smaller temporary badges because we were charter members and those were replaced when our real badges came in the mail. This is only done for installations, though. Mine has pearls and the Eta Mu guard as well as the ritual dangle. I took off the guard one time when I was wearing a dress and never put it back on. We actually get ours as part of the standard initiation fee. We can buy others but the only options national offers is different levels of gold. Though I did see a beautiful one on ebay with garnets set along the sides of the badge. We don't offier different types of gemstones with our badges (only pearls), but we do offer silver now and I see people going with that now intead of the gold option. Back when I joined, i'm pretty sure it was only available in gold. Ohh, I didn't know they offered silver now! We only had gold back when I joined and the options were 3 pearls at the points, crown pearls all around or closed pearls all around. Since we were the first to get badges everyone did the crown pearls if I remember correctly. We had no knowledge of chapter guards either. I think only two of us went and got those. I got mine with pearls, and another girl got hers in just gold. I don't think guards have caught on with the chapter at all since it was installed. Sometimes I think it would be fun to have the option of having other gem stones, but then again the fact that all our badges are all similar is pretty awesome. Ohh, I didn't know they offered silver now! We only had gold back when I joined and the options were 3 pearls at the points, crown pearls all around or closed pearls all around. I'm curious... what is the difference between crown pearls and closed pearls? Hmm, now that you mention that I think my husband (Phi Delt) got his through the initiation fee too. There's no way he would've bought it separately Is this a typical men's-fraternity practice? Oh interesting- I just looked on Phi Delt's website and at first thought I read it wrong... but apparently many people related to Phi Delts can wear their badges: "The Code provides that only initiated members of the Fraternity, their mothers, wives, daughters, sisters, or fiancées should wear the badge." Last edited by thetygerlily; 10-29-2009 at 06:21 PM. I don't know, but at least one more fraternity I know of (Theta Chi) does it as well. And that is interesting as well. I know we have a sweetheart pin which is a smaller version of our badge that our sweethearts can wear. Our badges come standard - they are not included in your initiation fee, but are mass ordered by the chapter before initiation and paid for in your Associate Member dues (at least in my chapter). 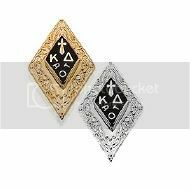 The badge you receive at initiation is a plain gold filled badge with the "delta" set in black enamel. You can upgrade to a variety of options - crown pearl delta, crown pearl delta with garnet points (my favorite), and black enamel delta with pearl points and a pearl in the center - all real gold. There are also various historical replica badges offered as well as custom badges you can have made with proper licensing fees. I guess we mass order because they are the cheapest (25-30 dollars) and most guys wouldn't choose to make that investment at that point in time. The badge may be worn by mothers, sisters, fiancees, wives, and house mothers. 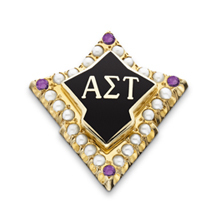 It is identical to our member badge but the delta is slightly smaller, you can get it in black enamel or crown pearls with a garnet in the center. ETA: I think I've talked about this before, but guards are not very common because it is difficult to get them in English letters instead of Greek (our chapters are named after their host institution). If a man chooses a guard it is usually the Coat of Arms or a key shaped guard signifying his completion of the K.E.Y. Program for continued member education. Last edited by Gusteau; 10-30-2009 at 11:33 AM. KSUViolet may be able to help me on this, but part of me thinks it has to do with the setting. My other thought is that crown pearl might be just half a pearl, while the closed is the full pearl. It's honestly a good question which I might have to look up!!! My badge was a hand me down. I think I was the 4th person to wear it. I hand it down to my little, who hand it down to his little . . .
Crown pearl is a whole pearl, usually bigger, and set higher. Look at the price differences. This. I got the crown pearl version of our badge when I joined. Ahh, good to know! I knew that the closed was the middle of the three we could get, but when we were installed the consultant let us know that it is the most popular so we just went with that. Thanks for the clarification! Next time I'm around sisters, probably on Founders Day with the Alumni Chapter, I'll have to ask if anyone has the crown pearl that I can see! Our badges are come standard - they are not included in your initiation fee, but are mass ordered by the chapter before initiation and paid for in your Associate Member dues (at least in my chapter). Twenty years later I worked with our UCLA chapter and the collegians all just wore the plain gold-filled badge that comes with our initiation fee. The girls rarely wore their badges or had any interest in them. I found it really sad. Last edited by Leslie Anne; 10-30-2009 at 01:18 AM.